Efficient endodontic treatment demands thorough debridement of the root canal system with minimal procedural errors. The inherent weakness of nickel–titanium alloys is their unexpected breakage. Modifications in the design, manufacturing, thermomechanical and surface treatment of alloys and advancements in movement kinetics have shown to improve the fatigue properties of the alloys, reducing the incidence of separation. This review enlightens the impact of these factors on fatigue properties of the alloy. Aim: This study aims to evaluate and compare the efficacy of various irrigation regimens on push-out bond strength of AH Plus/gutta-percha, Real Seal/Resilon, and MetaSeal/gutta-percha at three different root levels. Materials and Methods: Single-rooted mandibular premolars (n = 120) were prepared and divided into four groups (n = 30) based on irrigation regimen used: I: 5.25% sodium hypochlorite (NaOCl)-17% ethylenediaminetetraacetic acid (EDTA); II: 5.25% NaOCl-2.25% Peracetic acid (PAA); III: 5.25% NaOCl-18% 1-hydroxyethylidene-1, 1-bisphosphonate (HEBP) (Etidronic Acid); and IV: Distilled Water. Each group was further divided into three subgroups (n = 10); A: AH Plus/gutta-percha; B: MetaSEAL/gutta-percha; C: RealSeal/Resilon. 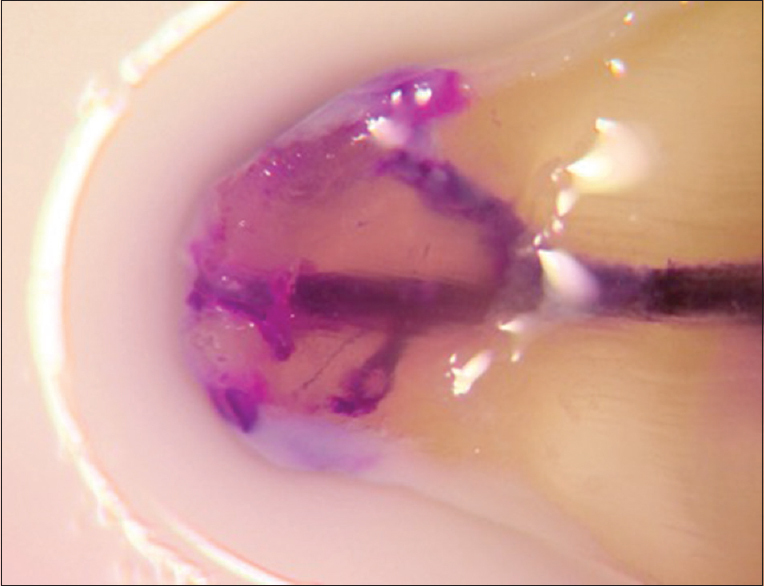 After obturation, roots were sectioned at 3 levels and push-out tests were performed. One-way ANOVA with post hoc Tukey-honestly significant difference tests were applied to assess the significance among various groups. Results: Among irrigants, 2.25% PAA showed significantly lower values when compared with rest of the irrigants. There was no significant difference found among EDTA and HEBP. The push-out bond strength of AH Plus was significantly higher among all sealers. The bond strength values were significantly decreased in apico-coronal direction. Conclusions: There was superior efficacy of EDTA and HEBP on the bond strength of AH Plus at apical root level when compared with other irrigants and sealers at various root levels. Aim: The aim of this study is to investigate the physical properties of conventional and resin-modified glass ionomer cements (GICs) compared to GICs supplemented with zinc oxide (ZnO) nanofiller particles at 5% (w/w). Methods: In this in vitro study, ZnO nanoparticles of different morphologies (nanospherical, nanorod, and nanoflower) were incorporated to glass ionomer powder. The samples were subjected to the flexural strength (n = 20) and surface hardness test (n = 12) using a universal testing machine and a Vickers hardness machine, respectively. Surface analysis and crystal structure of samples were performed with scanning electron microscope and X-radiation diffraction, respectively. The data were analyzed using one-way ANOVA, Shapiro–Wilk, and Tukey's tests (P < 0.05). Results: Flexural strength of glass ionomer containing nanoparticles was not significantly different from the control group (P > 0.05). The surface hardness of the glass ionomer containing nanospherical or nanoflower ZnO was significantly lower than the control group (P < 0.05). However, the surface hardness of glass ionomer containing nanorod ZnO was not significantly different from the control group (P = 0.868). 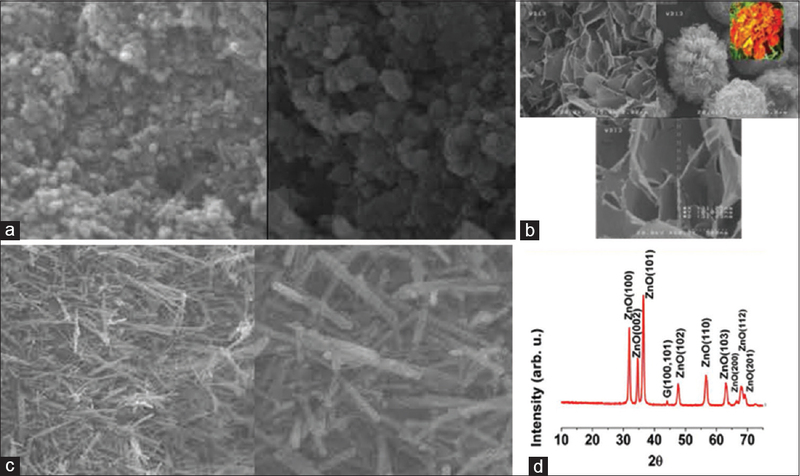 Conclusions: Incorporation of nanospherical and nanoflower ZnO to glass ionomer decreased their surface hardness, without any changes on their flexural strength. Incorporation of nanorod ZnO particles caused no effect on the mechanical properties. Aim: The aim of this study is to evaluate the impact of dentin condition on bond strength of multi-mode adhesive systems (MMAS) to sound and artificially induced caries-affected dentin (CAD). 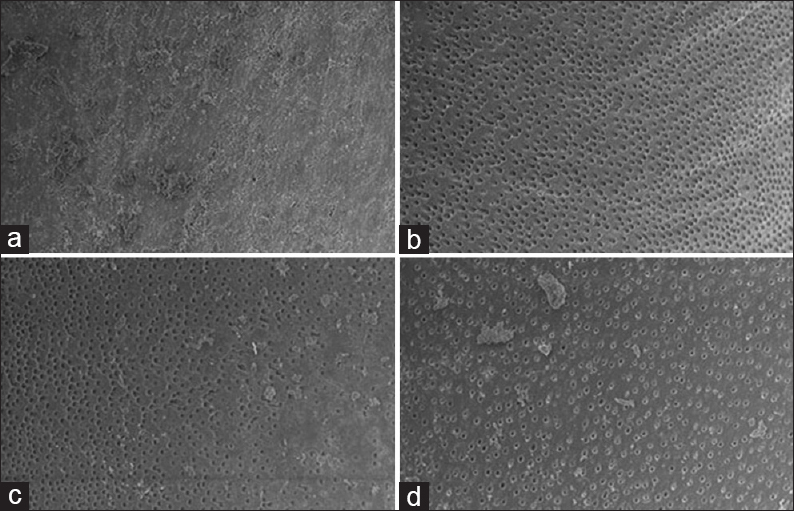 Methods: Flat dentin surfaces of 112 bovine incisors were assigned to 16 subgroups (n = 7) according to the substrate condition (sound and CAD– pH-cycling for 14 days); adhesive systems (Scotchbond Universal, All-Bond Universal, Prime and Bond Elect, Adper Single Bond Plus and Clearfil SE Bond) and etching strategy (etch-and-rinse and self-etch). All systems were applied according to the manufacturer's instructions, and resin composite restorations were built. After 24 h of water storage, specimens were sectioned (0.8 mm2) and submitted to the microtensile test. Statistical Analysis: Data (MPa) were analyzed using three-way analysis of variance and Tukey's test (α = 0.05). Results: MMAS presented similar bond strength values, regardless etching strategy in each substrate condition. Bond strength values were lower when MMAS were applied to CAD in the etch-and-rinse strategy. Conclusion: The etching strategy did not influence the bond strength of MMAS to sound or CAD, considering each substrate separately. However, CAD impact negatively on bond strength of MMAS in etch-and rinse mode. Purpose: This study evaluated the immediate bonding effectiveness of five self-etch adhesive systems bonded to dentin. 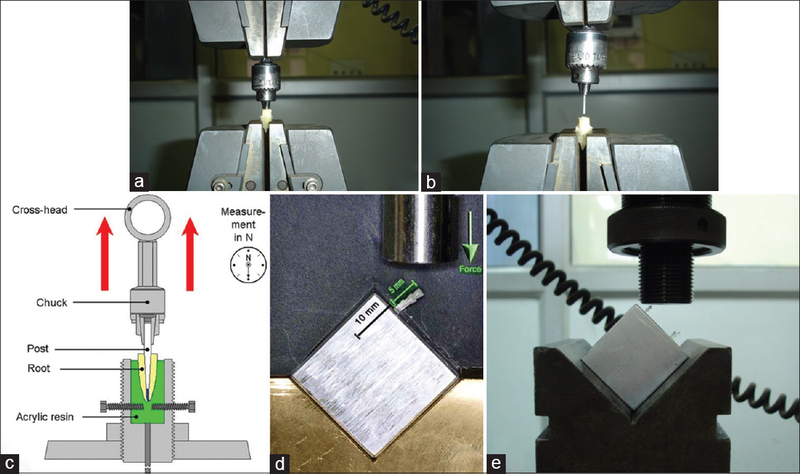 Materials and Methods: The microtensile bond strength of five self-etch adhesives systems, including one two-step and four one-step self-etch adhesives to dentin, was measured. Human third molars had their superficial dentin surface exposed, after which a standardized smear layer was produced using a medium-grit diamond bur. The selected adhesives were applied according to their respective manufacturer's instructions for μTBS measurement after storage in water at 37°C for 24 h. Results: The μTBS varied from 11.1 to 44.3 MPa; the highest bond strength was obtained with the two-step self-etch adhesive Clearfil SE Bond and the lowest with the one-step self-etch adhesive Adper Prompt L-Pop. Pretesting failures mainly occurring during sectioning with the slow-speed diamond saw were observed only with the one-step self-etch adhesive Adper Prompt L-Pop (4 out of 18). Conclusions: When bonded to dentin, the self-etch adhesives with simplified application procedures (one-step self-etch adhesives) still underperform as compared to the two-step self-etch adhesive Clearfil SE Bond. Aim of the Study: The aim of this study was to compare the apical sealing ability of two single-cone filling materials when sealed with different types of root canal sealers. Materials and Methods: Eighty extracted maxillary and mandibular canines were selected and their crowns were cut. The root canals were prepared using ProTaper Universal rotary system until size F4 and then divided into seven experimental groups (n = 10 each) and two control groups (n = 5 each). Samples of Groups 1, 2, and 3 were filled with single-cone gutta-percha and AH Plus, MTA Fillapex, and EndoSequence BC, respectively. Samples of Groups 4, 5, and 6 were filled similar to the previous groups with the exception of using a single-cone CPoint. Samples of Group 7 were filled with cold gutta-percha lateral condensation technique. To assess apical microleakage, the apical linear dye penetration was measured microscopically and data were statistically analyzed. Results: All experimental groups showed significantly different dye apical leakage values (P = 0.000). No significant differences were found between Groups 1, 2, 4, 6, and 7 (P < 0.05). The lowest mean leakage value was observed in Group 6 (0.95 ± 0.56 mm) while Groups 3 (2.68 ± 0.71 mm) and 5 (2.61 ± 0.71 mm) showed significantly higher mean leakage values. 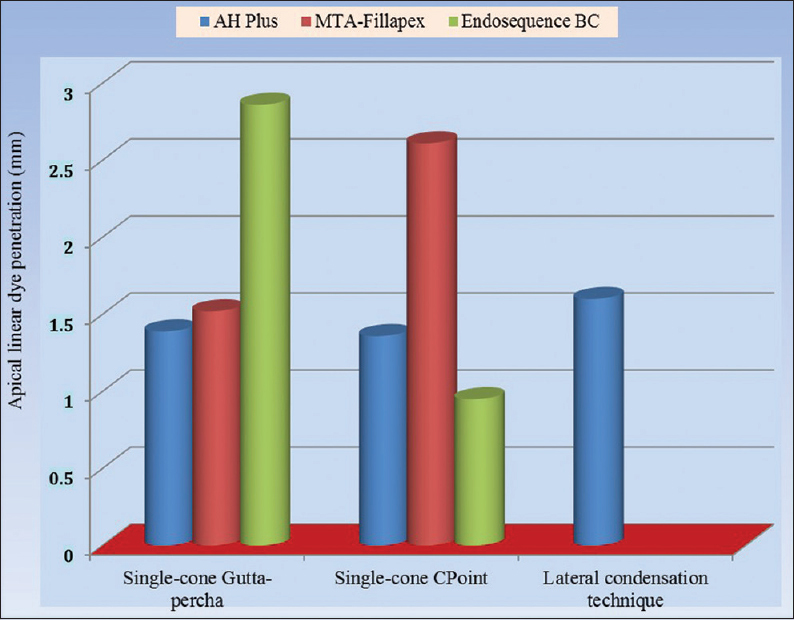 Conclusions: The lowest apical leakage value was observed with single-cone CPoint/EndoSequence BC but without significant differences when compared with single-cone gutta-percha/AH Plus, single-cone gutta-percha/MTA Fillapex, single-cone CPoint/AH Plus, and lateral condensation technique. Higher apical leakage values were observed with single-cone gutta-percha/EndoSequence BC and CPoint/MTA Fillapex. Introduction: The purpose of this study was to compare the incidence of dentinal crack formation after root canal preparation using ProTaper Next, OneShape, and Hyflex electrodischarge machining (HEDM). Materials and Methods: A total of 75 extracted mandibular premolars were selected. The root canals were instrumented using ProTaper Next, OneShape, and HEDM rotary files. All roots were horizontally sectioned at 3, 6, and 9 mm from apex with slow-speed saw under water cooling. The sections were observed under a stereomicroscope at ×25 to determine the absence or presence of crack. Data were analyzed using post hoc test and one-way ANOVA. Results: ProTaper Next and HEDM produced significantly less cracks than OneShape. Conclusion: Within the limitation of this in vitro study, it can be concluded that nickel–titanium instruments may cause cracks on the root surface. 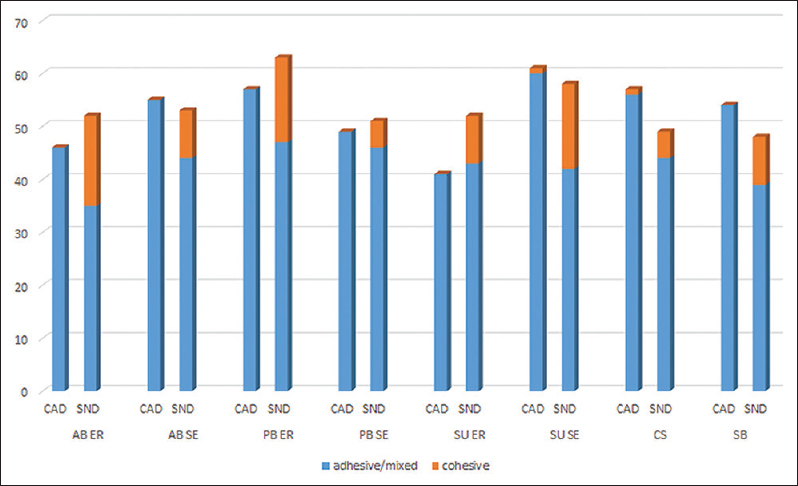 ProTaper Next and HEDM tend to produce less number of cracks as compared to OneShape. Aim: The aim of this study was to evaluate retention & fracture resistance of different fibre posts. Methodology: 90 extracted human permanent maxillary central incisors were used in this study. For retention evaluation, after obturation, post space preparation was done in all root canals and posts were cemented under three groups. Later, the posts were grasped & pulled out from the roots with the help of a three-jaw chuck at a cross-head speed of 5mm/min. Force required to dislodge each post was recorded in Newtons. To evaluate the fracture behavior of posts, artificial root canals were drilled into aluminium blocks and posts were cemented. Load required to fracture each post was recorded in Newtons. Results: The results of the present study show the mean retention values for Fibrekleer Parallel post were significantly greater than those for Synca Double tapered post & Bioloren Tapered post. The mean retention values of the Double tapered post & the tapered post were not statistically different. The Synca Double tapered post had the highest mean load to fracture, and this value was significantly higher than those of FibreKleer Parallel & Bioloren Tapered post. The mean fracture resistance values of Parallel & tapered post were not statistically different Conclusions: This study showed parallel posts to have better retention than tapered and double tapered posts. Regarding the fracture resistance, double tapered posts were found to be better than parallel and tapered posts. Background and Objectives: Image processing and enhancement filters can significantly improve the diagnostic value of digital radiographs. Evidence shows that increasing the contrast and filtering improve the diagnostic accuracy for caries detection. This study sought to assess the diagnostic accuracy of original and enhanced digital radiographs for the detection of approximal and occlusal caries. 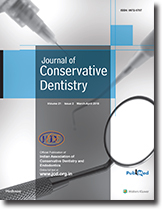 Subjects and Methods: In this experimental study, incipient carious lesions were artificially created on 120 proximal and occlusal surfaces of human extracted permanent molar and premolar teeth. After mounting the teeth in wax, digital radiographs were obtained using photostimulable phosphor plates and enhanced by enhancement filters 1, 2, and 3 with/without denoising. Two oral and maxillofacial radiologists blinded to filtering viewed the radiographs and filled out a chart. A definite diagnosis was made by a pathologist by observing the samples under a stereomicroscope (gold standard). Data were analyzed using SPSS software version 16. Interobserver agreement was calculated using kappa statistics. Chi-square test was used to assess the correlation between qualitative variables. Results: Assessment of sensitivity, specificity, accuracy, positive predictive value, and negative predictive value showed that enhancement filter 2 without denoising was the most efficient and original radiographs (filter free) were the least efficient radiographs for the detection of carious and sound surfaces. Application of filters significantly increased the accuracy of caries detection on digital radiographs. The lowest diagnostic accuracy was noted for the detection of enamel lesions on original radiographs (52%). Enhancement filter 2 plus denoising was the best filter for the detection of these lesions (79.25%). No significant difference was noted among different filters for detection of carious and sound surfaces but enhanced, and original radiographs were significantly different in visualization and detection of caries (P < 0.05). 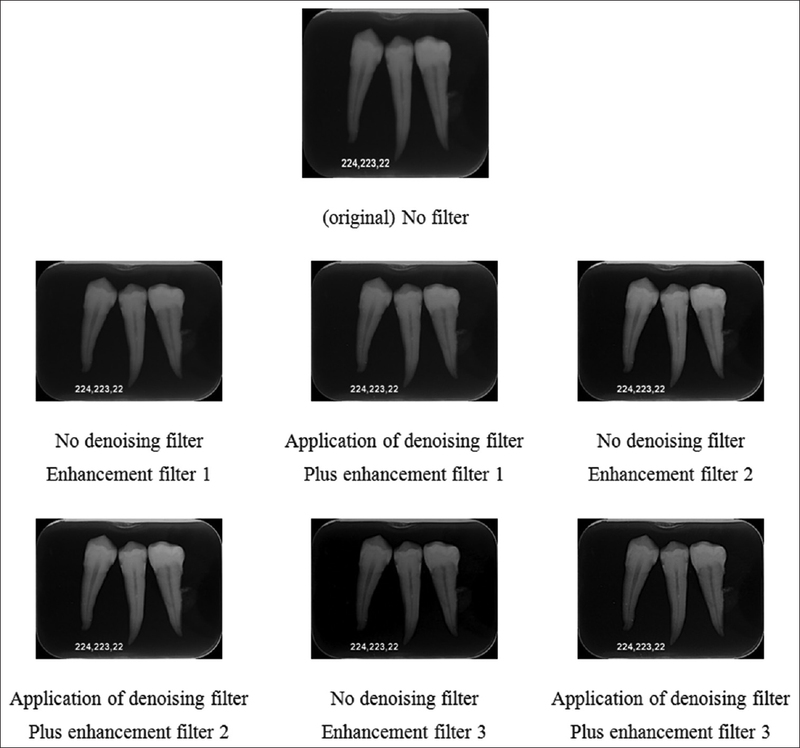 Conclusion: Application of enhancement filters, particularly enhancement filter 2 with/without denoising, increases the accuracy of caries detection on digital radiographs. Aim: This study aimed to describe the morphological and morphometric aspects of fused mandibular second molars with radicular shallow grooves using micro-computed tomography (CT). 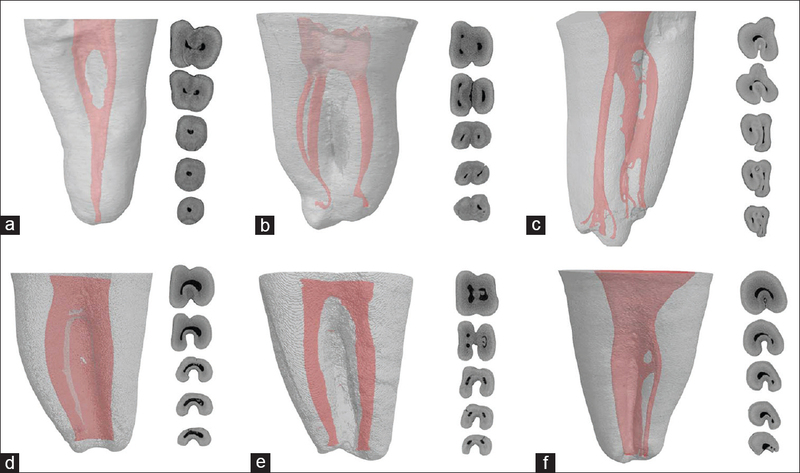 Materials and Methods: Eighty-eight mandibular second molars with fused roots were scanned in a micro-CT scanner at a voxel size of 19.6 μm. After reconstruction, only molars without C-shaped roots and presenting shallow radicular grooves were selected. 30 molars were chosen for further analysis. Canal cross-sections were classified according to Fan's modified classification (C1, C2, C3, and C4) and morphometric parameters at the apical region, examination of accessory foramina and tridimensional configuration were evaluated. Results: Three-dimensional reconstructions indicated a higher prevalence of merging type (n = 22). According to Fan's modified classification, the C4 configuration was predominant in the 3 apical mm. Roundness median values revealed a more round-shaped canals at 3 mm (0.72) than at 2 (0.63) and 1 (0.61) mm from the apex. High values of major and minor diameters were observed in the canals of these evaluated sections. In addition, few accessory apical foramina were observed at 1 and 2 mm from the apex. The average distance between last accessory foramina and the anatomic apex was 1.17 mm. A less complex internal anatomy is found when a mandibular second molar presents fused roots with shallow radicular grooves. The merging type canal was frequently observed. Moreover, the C4 configuration was predominant at a point 3 mm from the apex and presented rounded canals, large apical diameters, and few accessory foramina. The cervical and middle thirds presented C3 and C1 canal configurations most frequently. Conclusion: A minor morphological complexity is found when fused mandibular second molars present shallow radicular grooves. Aim: The aim of this study is to evaluate in vitro, using artificial lateral canals, the rate of dissolution of the pulp tissue through different protocols of canal irrigation. Materials and Methods: One hundred artificial canals provided with lateral canals have been used. Each lateral canal was filled with pulp tissue and calibrated to 0.002 mg. All canals were irrigated using five different protocols. Five groups have been used for the experiment: Group A, distilled water (control); Group B, preheated NaOCl; Group C, NaOCl heated inside the canal; Group D, NaOCl ultrasonically activated; and Group E, NaOCl heated inside the canal with ultrasonic activation. All samples were weighed through professional microbalance in three different phases: before insertion of the pulp tissue into the lateral canal, after insertion of the pulp tissue and, finally, after different protocols of irrigation. A statistical analysis with Kruskal–Wallis test and Mann–Whitney test was performed. Results: The partial dissolution of the pulp tissue inside the artificial lateral canal occurs only using the protocol with NaOCl heated inside the canal with ultrasonic activation. Other irrigation protocols are not able to dissolve the pulp tissue. Discussion and Conclusions: The main objective of endodontic therapy is the removal of damaged tissues and bacteria. Modern literature highlights that it is impossible to remove all the pulp tissues and bacteria from the whole endodontic space. Hence, to achieve excellence and get positive results in the short and long term, it is necessary to use techniques and technologies that may increase the degree of root canal detersion. Aim: The purpose of this study was evaluation and comparison of the contact angle of new root canal sealers – Hybrid Root Seal, mineral trioxide aggregate (MTA) Plus, and the conventional AH Plus sealer with dentin and gutta-percha. 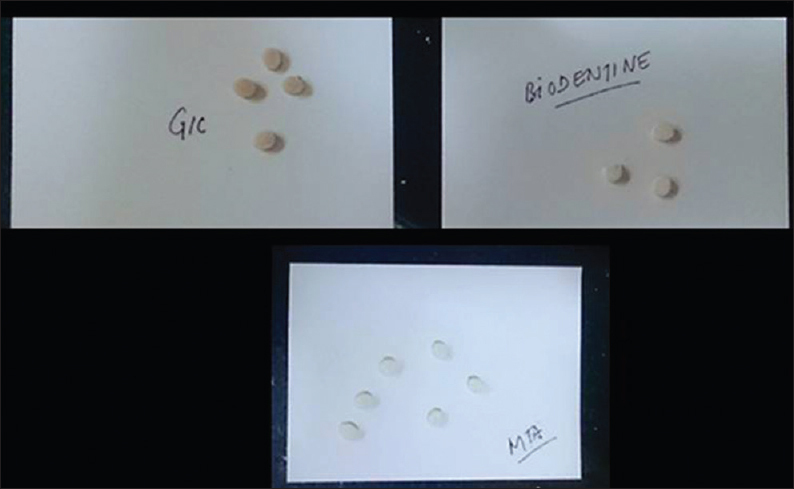 Materials and Methods: Two groups (Group D – dentin and Group G – gutta-percha) of 18 samples each were further randomly divided into 3 subgroups based on the type of sealer used, that is, AH Plus, Hybrid Root Seal, and MTA Plus. Contact angle measurement device (Phoenix 300) was used to measure the contact angle of the sealers on both dentin and gutta-percha. The results thus obtained were analyzed using one-way analysis of variance and Student's t-test. Results: MTA Plus recorded significantly higher values of contact angle on both the substrates, that is, dentin and gutta-percha when compared to AH Plus and Hybrid root canal sealer. The lowest value of contact angle in gutta-percha and dentin was shown by Hybrid root canal sealer and AH Plus, respectively. Conclusion: Both AH Plus and Hybrid Root Seal exhibited lower contact angle values, and hence, better wettability on both dentin and gutta-percha as compared to MTA Plus. Aim: The aim and objective of this study was to evaluate and compare the sealing ability of EndoSequence BC RRM-fast set putty, Proroot mineral trioxide aggregate (MTA), and Zirconomer in the repair of furcal perforation by measuring dye leakage under stereomicroscope. Methodology: A standard access cavity was made on forty-eight extracted mandibular and maxillary first molars followed by creating a furcal perforation in the center of the pulp chamber by using No. 4 round bur (creating a perforation of 2 mm diameter). Teeth were categorized into 4 groups containing 12 samples in each group based on material used for furcation repair. Group 1 – Endosequence BC RRM-fast set putty; Group 2 – Zirconomer; Group 3-MTA (positive control); Group 4 – negative control. All groups were covered with two layers of clear varnish except for 2 mm around the perforation region. All the teeth were immersed in 2% methylene blue dye for 48 h for dye penetration. Teeth were sectioned buccolingually using a diamond disk. The sectioned teeth were examined under stereomicroscope with ×10 magnification for dye penetration. Results: Endosequence showed less microleakage than MTA but not statistically significant. Zirconomer showed statistically significant higher microleakage. Conclusion: Endosequence and MTA showed less microleakage hence can be used as furcation repair materials. 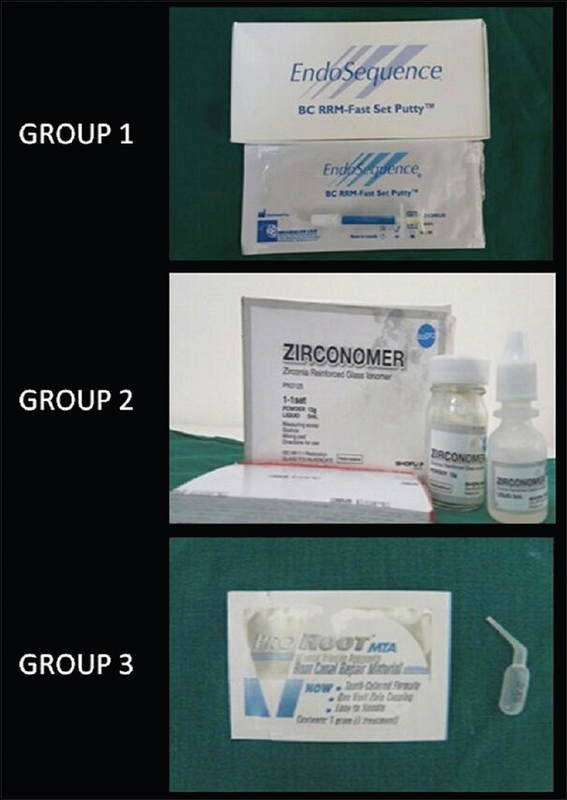 Due to higher microleakage, Zirconomer should be avoided as furcation repair material. Due to its favorable cost, ready availability, and almost similar outcome as bioceramics, MTA is considered as an alternative to Endosequence and is the gold standard in furcation repair. Aims: The aim of this in vitro study is to evaluate and compare the smear layer removal efficacy of etidronic acid-based irrigating solution with others in the apical third of the root canal. Materials and Methods: Forty human single-rooted mandibular premolar teeth were taken and decoronated to standardize the canal length. After biomechanical preparation, teeth were randomly divided into four groups (n = 10) and the final irrigation was carried out with tested irrigants. Group I: normal saline (negative control); Group II: 5.25% sodium hypochlorite (NaOCl) with surfactant and 17% ethylenediaminetetraacetic acid (EDTA) with surfactant; Group III: freshly mixed BioPure MTAD; and Group IV: freshly mixed Chloroquick solution. The teeth were split into two halves and observed under a scanning electron microscope to analyze the amount of smear layer present. Statistical Analysis: Data were analyzed using the Kruskal–Wallis test and Mann–Whitney test. Results: Group II (5.25% NaOCl with surfactant followed by 17% EDTA with surfactant) showed least smear layer scores (1.1 ± 0.3162). This was followed by Group III (MTAD) (2.2 ± 0.4216) and then Group IV (Chloroquick) (2.4 ± 0.5164). Conclusion: Sequential use of 5.25% NaOCl with surfactant and 17% EDTA with surfactant was found to be the most efficient than MTAD and Chloroquick in the removal of smear layer in the apical third of root canal. Introduction: With the introduction of calcium silicate materials, pulp capping procedure has been simplified due to their therapeutic pulp capping capabilities and ability to be used as a provisional bulk restorative material simultaneously. The quality of the adhesive bond between these cements and composite is of clinical significance with regard to the longevity of the final laminate restoration. Thus, this study aims to compare the in vitro microtensile bond strengths of resin composite to different calcium silicate cements versus glass ionomer cement (GIC). Materials and Methodology: Resin composite was bonded to standardized disks of Biodentine, mineral trioxide aggregate (MTA), and GIC. The samples were divided into the following three groups, and each group was further divided into two subgroups based on the aging time (1 and 2 weeks) of the samples: (1) Group 1 – phosphoric acid etching on Biodentine. (2) Group 2 – phosphoric acid etching on MTA. (3) Group 3 – phosphoric acid etching on GIC. After bond aging, the microtensile bond strength was analyzed using the Instron universal testing machine. Results: There was no significant difference in micro-SBS between 1- and 4-week bond aging of MTA and Biodentine group, while a significant decrease is seen in the GIC group. Conclusion: Calcium silicate cements are weak in the early setting phase. Thus, placing the overlying composite is best delayed for at least 2 weeks to allow adequate maturation of the material. 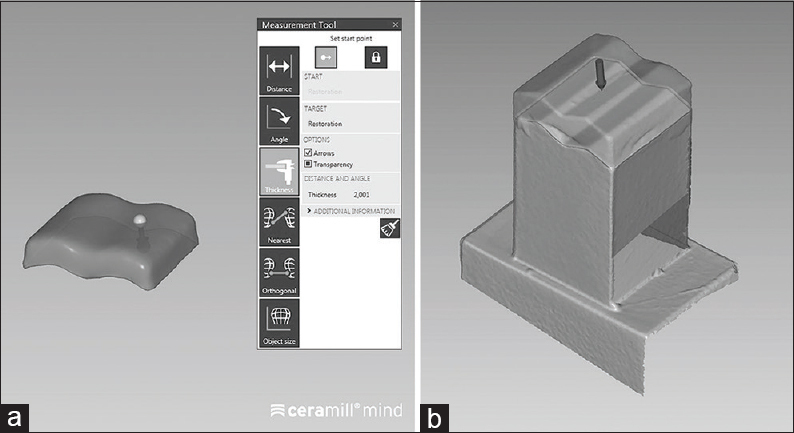 Aim: This study aims to evaluate the microshear bond strength of zirconia-based ceramics with different resin cement systems and surface treatments. Materials and Methods: Forty blocks of zirconia-based ceramic were prepared and embedded in polyvinyl chloride (PVC) tubes with acrylic resin. After polishing, the samples were washed in an ultrasonic bath and dried in an oven for 10 min. Half of the samples were subjected to sandblasting with aluminum oxide. Blocks were divided into four groups (n = 10) in which two resin cements were used as follows: (1) RelyX™ U100 with surface-polished zirconia; (2) RelyX™ U100 with surface-blasted zirconia; (3) Multilink with surface-polished zirconia; and 4) Multilink with surface-blasted zirconia. After performing these surface treatments, translucent tubes (n = 30 per group) were placed on the zirconia specimens, and resin cement was injected into them and light cured. The PVC tubes were adapted in a universal testing machine; a stiletto blade, which was bolted to the machine, was positioned on the cementation interface. The microshear test was performed at a speed of 0.5 mm/min. Failure mode was analyzed in an optical microscope and classified as adhesive, cohesive, or mixed. Results: The null hypothesis of this study was rejected because there was a difference found between the resin cement and the surface treatment. There was a statistical difference (P < 0.005) in RelyX™ U100 with surface-blasted zirconia, in relation to the other three groups. 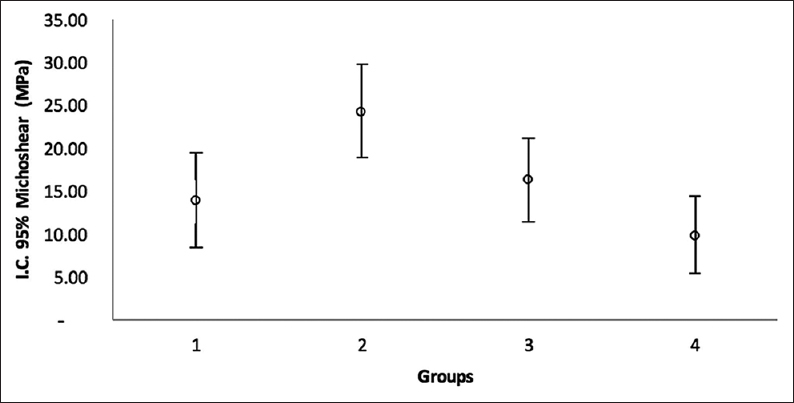 For Multilink groups, there was no statistical difference between them. Conclusion: Self-adhesive resin cement showed a more significant tendency toward bond strength in the ceramic-based zirconium oxide grit-blasted surfaces. Background: Pulpal infections are caused by varied number of organisms and are located in various sites of root canal system. Thus, the success of root canal treatment depends on complete eradication of microbiota. Materials and Methods: Thirty-two patients were selected and divided into four groups (photoactivated disinfection [PAD], diode laser, 5% sodium hypochlorite [NaOCl], and normal saline). The treatment was done according to groups, following manufacturer's instructions. The efficacies of groups were evaluated using microbial culturing technique. Three samples were taken for each group and were incubated separately for aerobic and anaerobic culture. Microbial counting was done for each sample in the form of colony-forming units. Results: It was evaluated using two-way analysis of variance and Friedman test. All the groups showed reduction in number of bacteria. However, for group A P < 0.0001 when analyzed for aerobic and anaerobic microorganisms, whereas, with Group B and C, P < 0.0001 for aerobic microorganisms. Conclusion: PAD, diode laser, and 5% NaOCl showed antibacterial action against aerobic and anaerobic bacteria. Statement of Problem: The current ceramic onlay preparation techniques for cuspal areas involve the reduction of cusps following the cuspal anatomy and the removal of all sharp angulations. However, there is little research literature studying the effect of occlusal preparation angles. Furthermore, there is no recent literature on the effect of angulations on IPS e.max computer-aided designed (CAD) (e.max) ceramic onlays. Purpose: The purpose of this study is to investigate the effect of geometric cuspal angulation and different internal preparation angles on the fracture strength of e.max CAD ceramic onlays. Materials and Methods: Sharp (33° and 22°) and round (33° and 22°) preparations were tested, each group having 10 specimens. e.max ceramic onlays were milled, sintered, glazed, and then bonded onto geometric tooth models. Fracture strength was measured at the initial fracture with a universal testing machine. The load was applied laterally to the central fossa (2-point contact) and vertically to the cusp peak (1-point contact). Results: A reduced cuspal angulation of 22° resulted in a stronger ceramic onlay than a 33° angulation when laterally loaded (P = 0.001). The presence of sharp angles weakened the ceramic significantly for both the 22° preparation (P = 0.0013) and 33° preparation (P = 0.0304). Conclusion: This in vitro study found that preparation angles of 22° resulted in superior fracture strength during central fossa loading and that rounding the preparation resulted in significantly higher fracture strength when a cusp peak load was applied. When the cusp tip loading is applied, the preparation angle does not appear to influence the fracture strength. Aim: This in vitro study was conducted to evaluate the effect of EndoVac, EndoActivator, and Navy Tip FX irrigation system on lateral depth and percentage of sealer penetration into the dentinal tubules using confocal laser scanning microscope. 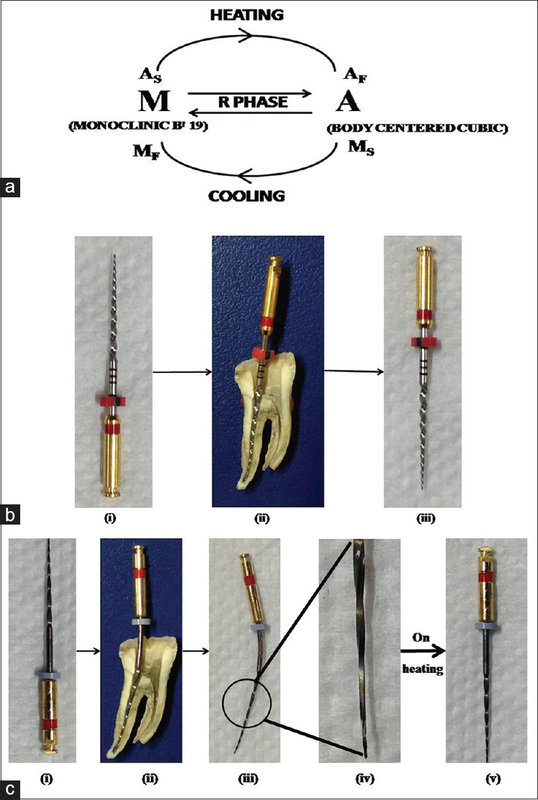 Materials and Methods: Forty recently extracted single-rooted mandibular premolars were taken and root canal treatment was performed using three different irrigation system, that is, EndoVac, EndoActivator, and Navi tip FX. The samples were divided into 4 groups according to the irrigation system used: Control or conventional needle (Group I), Navi Tip FX (Group II), EndoActivator (Group III), and EndoVac (Group IV). All teeth were obturated using AH Plus sealer labeled with fluorescent rhodamine B dye. The teeth were sectioned at coronal (5 mm), middle (3 mm), and apical 3rd (1 mm) from the apex. Total percentage and maximum depth of sealer penetration were measured using confocal laser scanning microscopy. The data were evaluated statistically using Kruskal–Wallis test with a 95% confidence level (P = 0.01). Results: EndoVac resulted in more sealer penetration then EndoActivator and Navi Tip FX irrigation system. 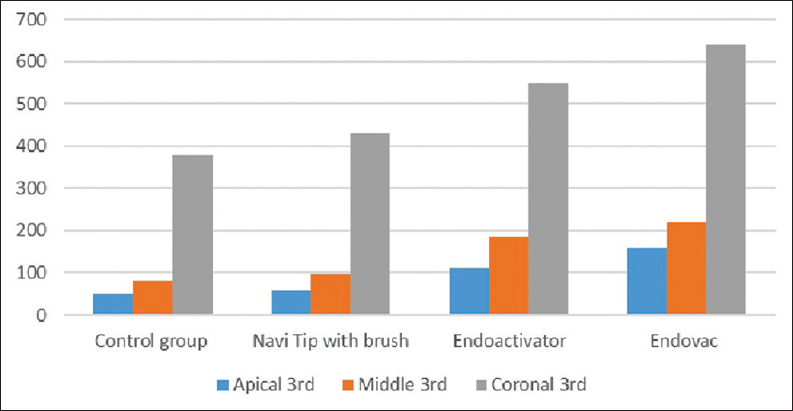 Endoactivator resulted in more sealer penetration in comparison to Navi Tip FX. Conclusion: Percentage and depth of sealer penetration were more at apical and middle 3rd with Endovac system followed by Endoactivator and Navi tip FX system. 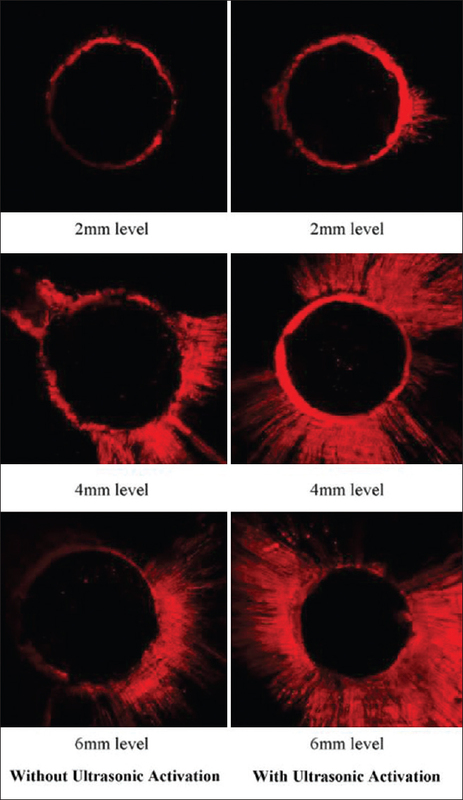 Aim: The aim of this study is to evaluate the effect of ultrasonic activation on the penetration depth of AH Plus, Acroseal, and EndoREZ sealers into dentinal tubules using Confocal laser microscopy. Methods: A total of 60 single-rooted teeth were prepared and divided into three groups on the basis of the type of sealer used (G1: AH Plus, G2: Acroseal and G3:EndoREZ). Each group was further subdivided into two equal subgroups on the basis of ultrasonic activation of sealers and nonactivation. Teeth were obturated and coronally sealed with GIC. Horizontal sections at 2 mm, 4 mm, and 6 mm from the apex were obtained, and the depth of sealer penetration into the dentinal tubules was measured using confocal laser scanning microscopy. Statistical analysis was performed using Students unpaired t-test, ANOVA, and Tukey's multiple comparison test. Results: Within the three groups, ultrasonically activated subgroups showed significantly (P < 0.05) higher depth of sealer penetration. Among the groups, Group 1 showed significantly (P < 0.05) higher depth of sealer penetration than Group 2 and Group 3 while the difference between Group 2 and Group 3 was not significant (P > 0.05). Conclusion: The use of ultrasonic activation with AH Plus sealer showed better results. Aim: The objectives of this study were to determine the bacterial contamination of the mobile phones that were used by the endodontist in comparison with the general dentist and also to determine the usefulness of titanium dioxide nanospray (TiO2NS) in mobile phone decontamination. Materials and Methods: Samples from the 60 mobile phones were taken using moist sterile swabs before, 10 min, and 1 week after the use of TiO2NS. Before collection of the swabs, the participants' informed consent was obtained. Samples obtained were cultured on blood agar to identify bacterial isolates. Results: All 60 mobile phone cultures were found to be culture positive. There was a significant reduction in the mean number of colony-forming units after decontamination with TiO2NS (P < 0.001). Conclusions: The results from this study showed that the mobile phones may act as an important source of nosocomial pathogens and TiO2NS would be an effective decontaminant. Therefore, it is important for dental professionals to practice routine mobile phone disinfection protocol to reduce the chances of occurrence of nosocomial infections. A metallic obstruction in the canal orifice of a maxillary right canine could not be bypassed during endodontic treatment. Aids such as ultrasonics and retrieval kits were not available for the removal of the obstruction. Therefore, a novel approach using a disposable syringe needle was employed. A 22-gauge needle was inserted into the orifice and turned in an arc with a gentle apical pressure and alternate rocking motion around the obstruction. This procedure was repeated few times to cut dentin and successfully dislodge and remove the obstruction using the sharp beveled tip of the needle. 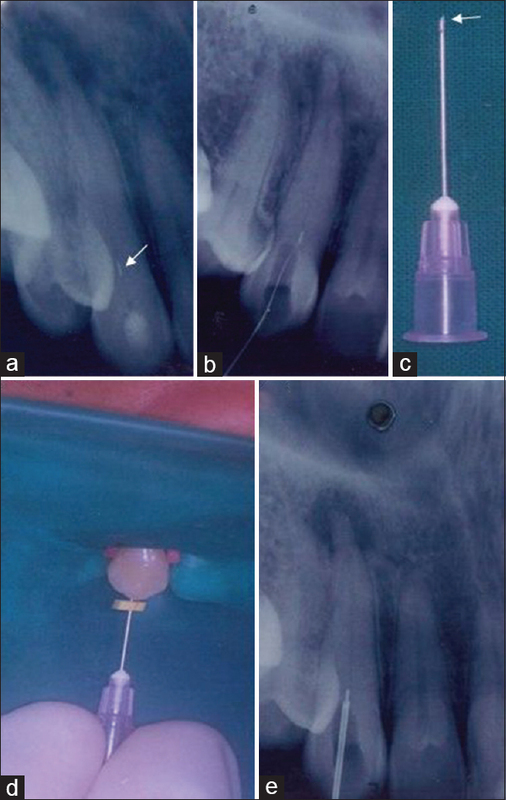 This case report demonstrates that, in the absence of other aids, the use of a disposable syringe needle is a simple, economical, and yet an effective technique for conservative removal of dentin and to dislodge and remove an obstruction from the root canal. However, its effectiveness depends on case selection and straight-line accessibility to the obstruction. Prognosis of a horizontal mid-root fracture is favorable, primarily because the dental pulp tends to maintain its vitality and the fracture segments are completely intraalveolar. Healing usually occurs with deposition of calcified tissue. However, if the segment coronal to the fracture becomes nonvital and infected, healing occurs by interposition of granulation tissue. This report describes a case of a horizontal mid-root fracture in a right maxillary central incisor tooth, where the apical fractured segment was significantly displaced in a linear direction. This was attributed to the pressure generated from the expanding granulomatous tissue that was interpositioned between the fractured segments. This resulted in an atypical radiographic presentation. In addition, this report highlights the role of cone-beam computed tomography in the diagnosis, treatment planning, and management of root fractures.